David Cameron seems to want to turn the UK into a haven for tax avoiders. At least we now know where we stand. In wooing French tax exiles, Cameron makes a mockery of democracy. "If the French go ahead with a 75% top rate of tax we will roll out the red carpet and welcome more French businesses to Britain and they will pay taxes in Britain and that will pay for our health service, and our schools and everything else." But hang on a minute. His chancellor said in March, "I regard tax evasion and indeed aggressive tax avoidance as morally repugnant". What's more, George Osborne pronounced himself "shocked" at the amount of tax avoidance in the UK. And yet, here's his boss saying the door's open to all and sundry French tax avoiders who want to set up camp in the UK. As for the businesses these tax exiles own, let me assure Cameron that they will stay put in France, because that's where their markets are and in the days of the internet the business owner does not have to live over the shop – something Cameron and Osborne have not yet noticed. So we won't win there. And that's inevitable – look at the world's tax havens and you'll see that nothing but the pretence of money shuffling occurs in those places. "Every country sets its own tax rates, but I think in a world of global capital, in a world where we're competing with each other, in a world where we want to send a message that we want you to build businesses, grow businesses and invest, I think it's wrong to have completely uncompetitive top rates of tax." Now that's really interesting, because this is the language of tax havens. It's places like Jersey, Cayman and the British Virgin islands who usually talk the language of tax competition that underpins Cameron's comments. And, of course, it's tax havens such as Switzerland that exist to roll out the red carpet for tax exiles. They all do it by offering low tax rates – something the UK is also capable of doing through its generous tax residence rules and domicile rules. Perhaps it's no surprise that Philip Stevens of the Financial Times recently quoted a German official saying that the UK opting out of a European banking union would turn us into a "Greater Guernsey". Could it be that with these comments Cameron has confirmed that "tax haven UK" is the new plan that he and George are hatching? Cameron is already trying to pick over the carcass of France. No doubt he'll do the same for Spain and Italy too, while Greek ship owners have always had a special place in British tax planning with their abuse of our domicile rule. That domicile rule ensures that all those not born in the UK enjoy favourable tax treatment if they live here. It's an unfair prejudice and socially divisive. What more could you do to show how dedicated the UK is to increasing inequality by helping the wealthiest immigrants get richer while the rest head ever closer to the economic misery of poverty? And we know that house price inequality caused by wealthy immigrants to the south-east and London makes housing inaccessible to the vast majority in those areas. 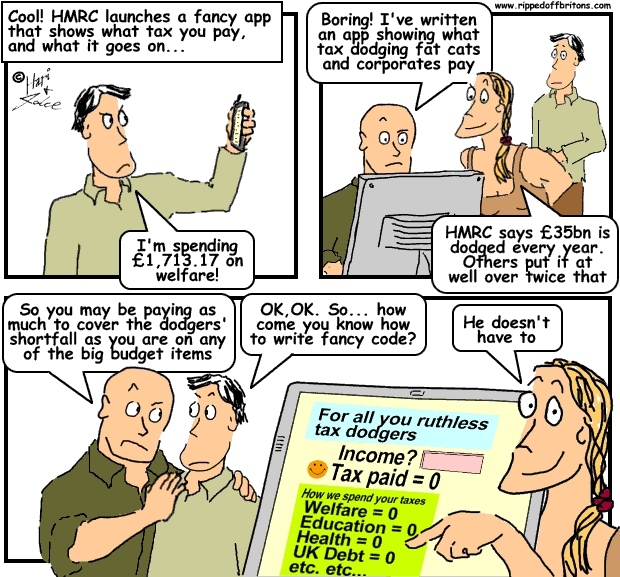 "The British tax system is unfair. It charges the vast majority of people the basic rate of income tax, and expects them to pay. 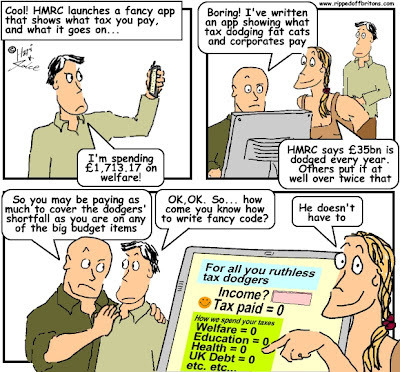 It asks a minority to pay higher rates of tax, and then invites them to avoid it." That's right. And The Times has demanded that the tax system be changed. But if Cameron has his way he'll keep all the prejudice, bias, discrimination and abuse in place, and all for the purpose of undermining our international allies and EU partners in their efforts to balance their books and restore economic wellbeing. Except it's even worse than that. What he's also said is he'll seek to undermine a decision that the people of France have democratically chosen. That's what tax havens do – they hold democracy in contempt. This all bodes ill for equality and for our hopes of diversifying the UK economy away from a finance industry dedicated to servicing transient wealth that holds the long-term residents of the UK in contempt. All we can say in that case is thanks Dave: at least you've set out your true agenda. Has anybody read Nicholas Shaxson's 'Treasure Islands'? According to him, the BOE is already one of the world's largest tax-havens. Is he wrong? Combine the UK with British Oversease Territories and the Channel Islands we are second to none as a tax haven. They are Gangsters simple as that! !